A skike or plural skikes are sport devices for a quite young sport. With skikes, recreational athletes and competitive athletes can enjoy a well known sport all throughout the year; a mixture of skiing and skating, only on footpaths. Skikes are a mix of ski rollers and inline skates, but they have the advantages of mountain bikes. Skikes have two very effective, hard coded brakes and real pneumatic tires. High safety, stability and off-road capability are the results. You can train with skikes on and off road, which makes their range of application huge. The word skike is a neologism that is a combination of the terms "skate" and "bike". Instead of "skate" you could also use the word "ski" and would end up with the same term "skike". What are the characteristics of skike? Skikes have convenient pneumatic tires that offer a very good road adherence, tracking stability and excellent brake action. Due to the pneumatic tires, skikes are not only suitable for asphalt, but also for off-road paths (e. g. on forest tracks, very rough asphalt etc.). You can also absolutely skike on wet surfaces without any risk. The good road adherence provides short braking distances and a reliable, confidence inspiring straight line discharge. Additionally, the long wheel base of the skikes enormously decreases the risk of an accident. Two liable and easy to use brakes strike at once. They are activated by a soft backward pushing of the lower leg and are available for every driving situation. The certified brake action of about 6.5 m/s² is almost of the same quality of good bicycle brakes. Therefore, skikes offer assured safety even for higher speed. This is a feature that does not apply to for example ski rollers, inline skates and non-braking cross-skates in its entirety. You can skike with sturdy shoes (e. g. hiking boots), because skikes have a big field of adjustability. On long day trips or in very impassable areas you can continue to walk at any time or to stop for a bite to eat somewhere. Whoever wants to show the skikes to friends can easily get into them and start skiking. 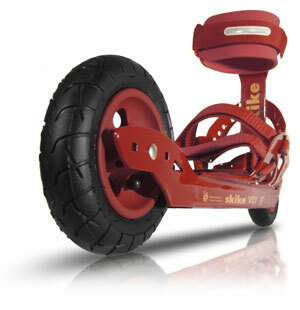 For people with small feet and children, the company Skike has developed a second model: the Skike S (or kid's skiks). This enables you to skike with a size shoes of 28 to 38. The Skike S also has the approved pneumatic tires and two brakes.